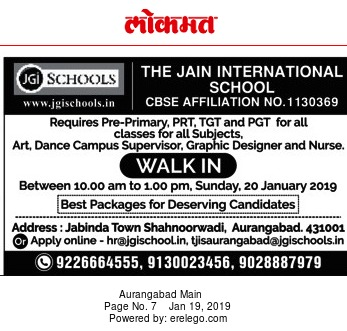 The Jain International School, Aurangabad has advertised in the LOKMAT newspaper for recruitment of Teachers PGT / TGT / PRT / PPRT jobs vacancies. Interested and eligible job aspirants are requested to walk-in on 20th January 2019. Check out further more details below. About School: To create global citizens & world leaders of tomorrow through traditional values of love, creativity, empathy, sensitivity, capability, equanimity, responsibility, depth of character, social alignment, introspection and a global vision who can think globally and lead the better world tomorrow. How to Apply: Interested candidates are requested to attend the Walk-in interview with CV, originals & copies of certificates and recent PP size photo to the walk-in address provided below or apply via email.